Sited in a hidden meadow on the outskirts of Woodstock, this former summer camp has been lovingly transformed into a tranquil and unique family retreat. The 5 buildings offer a variety of living and creative spaces for all artistic or spiritual endeavors-whether it's music, visual or performing arts, yoga and meditation - there is space for all. The main farmhouse from 1925 has been fully updated and offers 3100 square feet of charm and comfort complete with rocking chair front porch and screened in back porch, from which to gaze at the meadow and mountain views. With four bedrooms and three full baths in the main house, a caretaker's apartment over the separate 2 car garage and a two story guest house on the other side of the in-ground pool, there will be no shortage of options for your guests! In addition, there are two fully functional and updated buildings - one the former mess hall, the other the former bunk house - that are currently used for an in-home business. 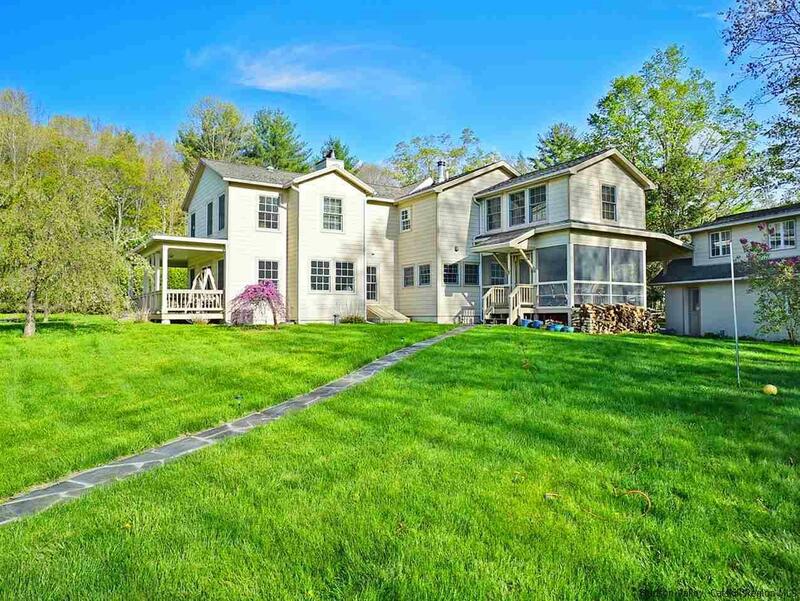 Across the meadow at the lower end of the 20+ acres is a lovely pond and former boat house which is charming and ripe for renovation should you need more space, or use for additional storage. Surrounding this special property are 100's of acres of DEP land accessed only from this property, aside from two neighbors not visible from anywhere in the house or on the land. Stone walkways, a large organic garden, gorgeous views in all seasons, wildlife galore! Your own private sanctuary only 10 minutes to town in one direction and 10 minutes to Route 28 toward the Thruway or Phoenicia in the other direction.